Why Do ISPs Have Data Caps? Data caps are one of the biggest hassles an Internet user will face. You pay for access but your ISP may limit that access for a number of reasons. Data caps are one of the biggest hassles an Internet user will face. These caps limit the amount of data you can transfer in a month, or the amount of bandwidth you can use at one time, or both. Whichever the case it often means slower connection speeds, bottlenecking and in the worst cases additional fees. Of course, the ISPs claim there are good reasons for the caps and in theory there are. What they really mean is that your ISP would rather charge you more to use the infrastructure in place than to spend money improving the Internet. Why do ISPs have data caps? To control the amount and rate of flow of data across the network. This is important in the sense that the network needs to be monitored and controlled to prevent overloads and outages. As our use of streaming content slowly increases, the need for such controls increases as well. This issue is also at the heart of Net Neutrality. Just what right do the ISPs have to block your use? Why Are ISPs Capping Data? The reality of the situation is so that they can charge you more money. More and more ISPs are rolling out data caps in order to limit the amount of access we have to the net. Not so they can altruistically manage the Internet for the good of us all, it’s so they can offer premium and add/on services to their customer base. Comcast in the US rolled out a nationwide data cap in 2016 that limits is customers to a single terabyte. Granted, a terabyte is a lot of data and equal to roughly 500 hours of streaming movies, a lot more than most people will use in a single month, but the fact remains that if you go over, your connection will be blocked and/or you will be charged more money. AT&T in the US took it to the next level and simply offers an unlimited plan for an additional $30 a month. What’s funny is that Comcast’s own internal reports show that those who actually do use more than 1 terabyte per month aren’t really harming anyone. Their response is that, if someone is using more they should pay for more. For basically the same reason as they cap data. To control the flow of traffic across the network. In the broad sense this is to protect the network, especially during high traffic times of day, but in the end is really just so they can make more money. If you want a faster connection, i.e. more bandwidth, you will have to pay for it. Companies like Netflix and other streaming media businesses have a big problem with this because it directly impacts their ability to deliver high quality services, and your ability to watch movies and play games without infernal buffering issues, herky jerky playback and dropped connections. Think about it, you pay for Internet and you pay for Netflix but you still can’t use it. That’s not right. Why do ISPs limit data? Why do ISPs limit bandwidth ? Because they can. Because they know we will pay up for more, if they limit our use. They know they are in control but they want to keep it that way. That’s why none of them are offering VPN services or even educate the public about them and the tremendous advantage they give to Internet users. How To Bypass Data Caps And Bandwidth Caps? 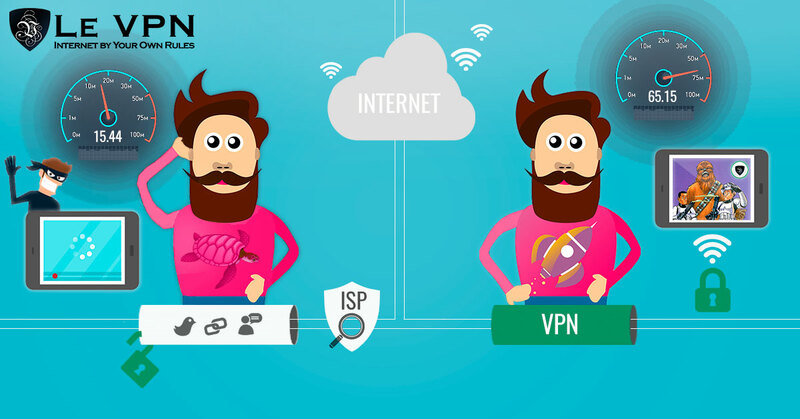 A VPN, virtual private network, is a means of securing your connections in a way that prevents your ISP from even knowing you are on the net. This means they can’t track you, log your data, cap your data usage or your bandwidth. The best part is that VPN like the one from Le VPN will also mask your IP address and allow you to stream geo-restricted content from around the world with no limit on bandwidth or data usage. When you use a VPN your ISP can impose whatever kind of cap it wants, but it just won’t matter. If you want to stream movies, if you want to avoid data restrictions, you need to get Le VPN now.